When I first started this website, I was SUPER excited to be asked to join the iHomeschool Network, which had (and still has) great writing prompts for homeschool authors. As part of its 10 * in * 10 series, for 10 weeks, lots of awesome homeschoolers shared their “Top 10” lists on a variety of themes. This post came out of 10 things we wouldn’t want to be without in our homeschooling/unschooling journey, and even as I look back at the list a few years after it was originally written, I realize these are pretty much all still absolute must-haves, so I guess I picked well! The whole brand, not just the magazine. Sarah loves NatGeo’s website, its books, its interest in wildlife conservation, its photography… and there isn’t a time when she digs in to one of their resources that it doesn’t lead her to say, basically, “I want to know more.” A lot of their items are a little pricey (the books sure are!) but you’d be amazed at what they offer for free on topics from civics to geography to biology and more! I’ve said it before, but The York County Library System is beyond phenomenal. I’ve gone to the same library since I was three or four years old, and Sarah has been going since she was old enough to get a library card. The summer reading program is actually paired with a hiking program, and this year’s is themed to astronomy, which Sarah loves. (You read about various things related to the theme, then follow written directions to hike to a “station” about the topic, where you do a crayon rubbing.) No matter where you live, check out your library’s programs. I think you’d be surprised how much they go “beyond books,” but how much they can offer in that area too. Especially the one within walking distance to our home – a former golf course turned into a walking trail! Being outdoors is a major, major factor in our learning and one of the biggest things that was missing from Sarah’s days when she was in public school. For her, almost anything is better once she spends a little time outside. All kinds of tape. Scrapbooking tape. Duct tape. Scotch tape. Clear tape. Masking tape. Washi tape. “Tape all the things” is Sarah’s unofficial motto, I think! This child has received tape as a gift and been thrilled. 5. A flexible work and life arrangement. I can’t discount the value of this. My change to a more flexible work-from-home career was THE deciding factor for us in being able to make the switch to homeschooling, but even the now-full-time job that Dan and I both have working for a medical school an hour from home is flexible in many ways. (And Sarah’s dad, Chris, who works at a newspaper full-time, benefits from some flexibility too.) That’s what allows us to go to an art museum on a Thursday… to stay up til midnight doing science experiments… and so much more. Wherever you can increase your flexibility, you will increase your happiness, whether that’s in homeschooling or elsewhere. Yeah, everyone says this. But everything from Wikipedia to Instagram to Pinterest to the aforementioned National Geographic resources online to Youtube to my mom’s iPad… these tools are a lifesaver, both for research and for my sanity. 7. Real and virtual friends. The is everyone from the iHomeschoolNetwork moms to my many Facebook friends… my friends who homeschool here in York County… and our friends who are still in the area’s public schools who keep us “hooked in” to the goings-on! (Not to mention who are willing to share their knowledge with Sarah on everything from hairdressing to business ownership to being an EMT to collecting postcards!) Tap into the knowledge of your friends. It’s amazing how much I’ve personally learned this way, and your kids will do the same. This program is great for everything from getting Sarah together with kids of all ages who share her interest in the outdoors to introducing her to places like a wolf sanctuary to giving her a chance to spend an hour one-on-one with a Master Gardener learning about butterflies and native plants to teaching her to make soap. 4-H isn’t just livestock. I would encourage you to contact your local cooperative extension and find out more about what programs (4-H and others) they offer in your state, if you’re based in the US! 9. Great local Goodwill/economy and thrift stores. You can find so many things there, from books to craft supplies to play clothes to inline skates that you can tear apart to build homemade skateboards… cheap! The previous post was A look back at our week: Anniversary, lake day and demolition derby. 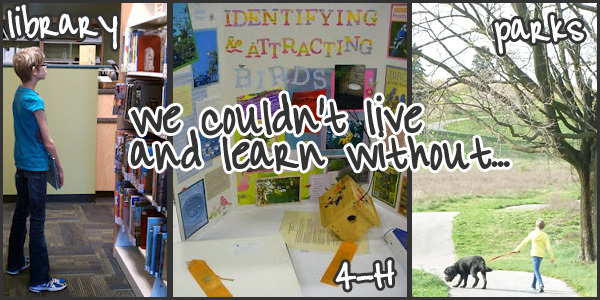 The next post is 10 reasons our daughter loves unschooling and homeschooling. Oooh, thanks for the National Geo site. It never occurred to me to check there! Somehow I’m not surprised! 🙂 I did the same on yours, as you saw! Beautiful list! I see several things that I should have included on my list. A flexible work/life schedule is so important and makes our learning lifestyle possible. Thanks for sharing!